When John Carlos raised his fist in a black power salute at the 1968 Olympics, it changed 20th-century history – and his own life – for ever. How does he feel about it now? You’re probably not familiar with the name John Carlos. But you almost certainly know his image. It’s 1968 at the Mexico City Olympics and the medals are being hung round the necks of Tommie Smith (USA, gold), Peter Norman (Australia, silver) and Carlos (USA, bronze). 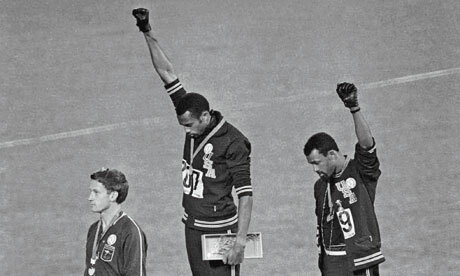 As the Star-Spangled Banner begins to play, Smith and Carlos, two black Americans wearing black gloves, raise their fists in the black power salute. It is a symbol of resistance and defiance, seared into 20th-century history, that Carlos feels he was put on Earth to perform. Carlos’s beginning was, to say the least, eventful. Raised by two involved, working parents, he learned to hustle with his friends in Harlem and fight his way out of and into trouble. As a teenager, he used to chase Malcolm X down the street after his speeches and fire questions at him. Carlos always knew he was good at sports and originally wanted to be an Olympic swimmer, until his father broke it to him that the training facilities he needed were in private clubs for whites and the wealthy. He used to steal food from freight trains with his friends and then run with it into Harlem and hand it out to the poor. When the police gave chase, he was often the only one who never got caught. Running came so naturally, he never thought of it as a skill. That single moment on the podium cost Carlos dear. More than four decades later, you’ll find him at his desk in a spacious portable building behind the basketball courts at Palm Springs High School in California, where he works as a counsellor. Among the family photographs on the wall are the vaguest allusions to his moment in history. Pictures of Malcolm X and African-American writer Zora Neale Hurston, the pledge of allegiance, which American schoolkids must say to the flag every day, and a small poster saying Go For Gold Olympics. Bald, tall, with a grey goatee, Carlos has glided into old age with a distinguished air and convivial manner, and more than a passing resemblance to the late activist and intellectual WEB DuBois. “The first thing I thought was the shackles have been broken,” Carlos says, casting his mind back to how he felt in that moment. “And they won’t ever be able to put shackles on John Carlos again. Because what had been done couldn’t be taken back. Materially, some of us in the incarceration system are still literally in shackles. The greatest problem is we are afraid to offend our oppressors. The image certainly captures that sense of momentary rebellion. But what it cannot do is evoke the human sense of emotional turmoil and individual resolve that made it possible, or the collective, global gasp in response to its audacity. 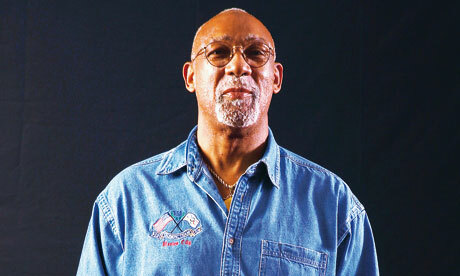 In his book, The John Carlos Story, in the seconds between mounting the podium and the anthem playing, Carlos writes that his mind raced from the personal to the political and back again. Among other things, he reflected on his father’s pained explanation for why he couldn’t become an Olympic swimmer, the segregation and consequent impoverishment of Harlem, the exhortations of Martin Luther King and Malcolm X to “be true to yourself even when it hurts”, and his family. The final thought before the band started playing was, “Damn, when this thing is done, it can’t be taken back. Joe Louis, a world champion boxer on whose shoulders rested national pride when he fought German Max Schmeling shortly before the second world war, greeted visitors at Caesars Palace in Las Vegas and went on quiz shows. And these were sporting figures who tried to keep in with the establishment. Carlos was still in his prime, but that single act of defiance ensured his marginalisation. Paradoxically, the next year was the best of his career. In 1969, he equalled the 100 yard world record, won the American Athletics Union 220-yard dash and led San Jose State to its first National Collegiate Athletic Association championship. The trouble was, in the years before lucrative sponsorship deals, running didn’t pay and few would employ him. In the years immediately following his protest, he worked security at a nightclub and as a janitor. At one point he had to chop up his furniture so he could heat his house. The pressure started to bear down on his family. “When there’s a lack of money, it brings contempt into the family,” he says. Moreover, his wife was facing constant harassment from the press and his children were being told at school that their father was a traitor. The marriage collapsed.